Now the real postseason can begin. The Yankees out-homered and out-bullpened the Athletics in the 2018 AL Wild Card Game on Wednesday night to punch their ticket to the ALDS. The final score was 7-2. After a 162-game regular season, the slate has been wiped clean. The Yankees and Red Sox will open the ALDS on Friday with identical 0-0 records. The Yankees opened the scoring against the opener. They struck real quick for a first inning 2-0 lead. Andrew McCutchen drew a five-pitch walk to begin the bottom of the first inning — McCutchen had 22 walks in 25 regular season games with the Yankees — and then Liam Hendriks caught a little too much of the plate with a fastball to Aaron Judge, who promptly deposited it into the left field seats. 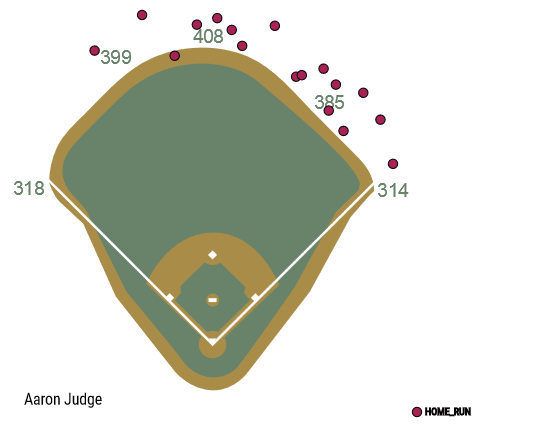 As good as he is and as strong as he is, Judge didn’t pull fastballs to left field for home runs often this season. He usually drove them the other way. It was good to see him get around on that fastball and pull it with authority. And fourth (fourthly? ), Judge hit that ball 116.1 mph. That was not only his hardest hit ball since coming back from the wrist injury (by four miles an hour! ), it was his hardest hit ball since June 4th, nearly two months before the injury. It was also the hardest hit postseason ball since Statcast became a thing in 2015. Good gravy. Just like that, the Yankees had a 2-0 lead. The first inning of the 2017 Wild Card Game was a disaster for Luis Severino. Three runs, one out. A total disaster. The first inning of the 2018 Wild Card Game was pretty much the exact opposite of that. Two strikeouts and a ground ball. Dominance. 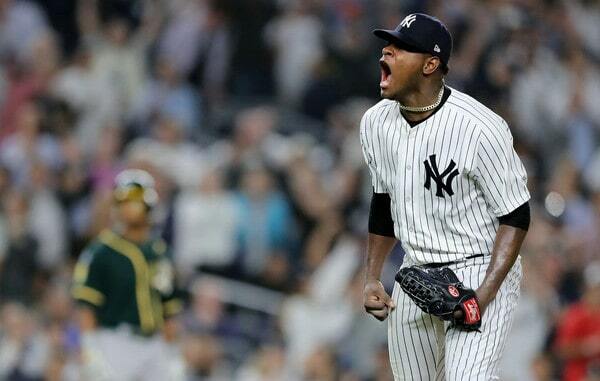 Severino was electric in that first inning and so was the Yankee Stadium crowd. As David Cone says, Severino is a Ferrari, and you can’t leave the Ferrari in the garage. That inning was why. Things did not come easily for Severino after that first inning, however. He walked Matt Olson with one out in the second inning — Olson worked a nine-pitch at-bat and fouled away three two-strike pitches — and went to three full counts that innings. Severino walked another batter in the third inning and, at one point, he went to a full count five times in the span of seven batters. He kept the A’s off the board (and out of the hit column), but they were making Severino work for it. The fourth inning was all set up for second guessing. After Jed Lowrie flew out on the first pitch, Khris Davis hit a ground ball to third, and Miguel Andujar’s throw short-hopped Luke Voit at first base. He was unable to make the scoop. A few things here. One, Andujar had plenty of time and still short-hopped the throw. Pretty bad. Two, it looked like a ball the first baseman should scoop. Not exactly Voit’s finest moment in the field. And three, it was the third ground ball hit by the A’s and the third wild throw by the Yankees. Matt Chapman hit a chopper to Andujar in the first inning and his throw pulled Voit off the bag, though he was able to apply the tag. In the third, Nick Martini hit a potential 3-6-3 (or 3-6-1) double play ball to Voit, but his throw was wide of second base, and Didi Gregorius had to stretch to make the catch. The Yankees got an out on that, but just one. Andujar’s error put Davis on first base with one out. Severino then walked Olson on six pitches to put runners on first and second with one out. The Yankees still led at the time. After the walk, I looked out to the bullpen to see whether anyone was warming up. Nothing. Seemed … questionable. Severino did get Stephen Piscotty to fly out to right field for the second out, but he then walked Ramon Laureano to load the bases. He walked him after being ahead in the count 0-2 as well, which is extra bad. The Yankees were up 2-0 but the A’s had the bases loaded with two outs, Severino was laboring, and the infield was throwing the ball all over the place. It was only then that Dellin Betances (!) started warming up. It seemed like Aaron Boone was giving Severino too long a leash. Fortunately, Severino struck out Marcus Semien to strand the bases loaded. Threw a fastball right by him and then let out a ferocious scream and fist pump. I noted this in the game thread: The A’s were the worst hitting team against 95+ mph fastballs during the regular season. They had the worst AVG, the worst SLG, and the worst wOBA. They can’t handle the heat. Severino’s pitch to strike out Semien was 99.6 mph. It was his fastest pitch of the night. There is definitely something to be said for the art of pitching. Sometimes though, you just need to throw a fastball by a hitter. I thought Severino was done after the fourth inning. He’d thrown 81 pitches through four innings, the A’s were working him hard, and he appeared to empty the tank against Semien. That scream after the strikeout looked like it took whatever was left out of him. Instead, Boone sent Severino back out for the fifth, and he promptly allowed back-to-back singles. Sigh. We’ll get to that in a bit. Severino’s line: 4 IP, 2 H, 0 R, 0 ER, 4 BB, 7 K on 87 pitches. Stud. Last year Betances was so far out of the Circle of Trust™ that he did not even warm up in the Wild Card Game. The Yankees needed 8.2 innings from their bullpen in last year’s Wild Card Game and Dellin never even warmed up. Even Chasen Shreve warmed up in the late innings. Not Betances though. That’s how far out of the picture he was after his late season control issues. The Yankees were up 2-0 in the fifth inning. The Athletics had runners on first and second with no outs. The 2-3-4 hitters (Chapman, Davis, Olson) were due up. This was a winner-take-all game. “We wanted Dellin for that part of the order,” said Boone after the game. Betances came in, and two fly balls and a strikeout later, the inning was over. The runners never advanced. He then struck out two in a scoreless sixth inning as well. Six up, six down. Betances had not entered a game as early as the fifth inning since 2014 (!) and he hadn’t thrown two full innings since May 23rd. He did both in the Wild Card Game on Wednesday. Love it. 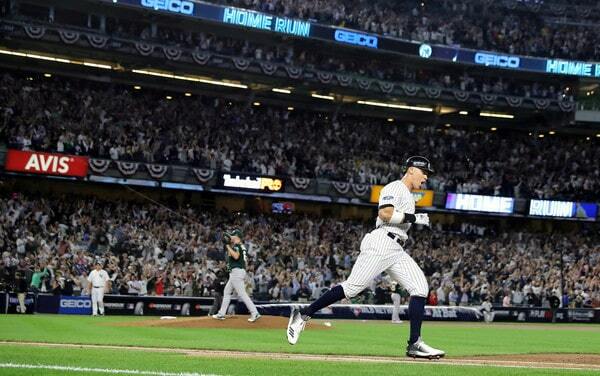 Go Dellin. I have to say, I did not expect the Yankees to break the game open against Blake Treinen. Fernando Rodney? Yeah, I could buy that. But Treinen? A’s skipper Bob Melvin made the curious decision to go to Rodney in the sixth inning against the 2-3-4 hitters. Four pitches and back-to-back doubles later, Judge and Aaron Hicks added an insurance run and the Yankees took a 3-0 lead. Hooray for that. After Rodney threw a first pitch wild pitch to Giancarlo Stanton to move Hicks to third with no outs, Melvin went to Treinen, his All-Star closer and owner of 0.78 ERA (1.82 FIP) with 31.8% strikeouts and 51.9% ground balls in 80.1 regular season innings. Treinen was ridiculous this year. My question: If you’re willing to use Treinen as early as the sixth inning, why not let him face Judge to start the inning? Oh well. Not my problem. Treinen walked Stanton to put runners on the corners with no outs — Giancarlo worked an eight-pitch at-bat (the last seven pitches against Treinen) and fouled away two two-strike pitches, which seemed to indicate Treinen was not razor sharp — and then American Hero Luke Voit dug in. Holy moly, what an at-bat. It was the kind of at-bat that makes you think Voit is for real. Nine pitches, three two-strike foul balls against Treinen hellsinkers, then a two-run triple (!) off the right field wall. It was nearly a homer. Good gravy what an at-bat. Yankee Stadium was rocking. And you know what? I totally called that. Not exactly, but close enough. I predicted a two-run double for Voit in the sixth inning. He hit a two-run triple in the sixth inning instead. Shoulda stopped at second to make me look smart, Luke. Fortunately, he did not stop at second, and Gregorius drove him in with a sacrifice fly for a 6-0 lead. Replays confirmed Voit slid around the tag. Melvin did what he had to do and he maxed out Treinen in the winner-take-all game. Treinen threw 42 pitches to get six outs. Stanton hit his 42nd and final pitch damn near to the moon for an eighth inning solo home run. Giancarlo’s home runs are just different, man. He hit that ball as high as I’ve seen a baseball hit at Yankee Stadium. Towering doesn’t even begin to describe it. That homer was 117.4 mph off the bat, by the way. Judge set a new postseason exit velocity record in the first inning. That record lasted seven innings. Treinen’s final line: 2 IP, 2 H, 3 R, 3 ER, 2 BB, 0 K, 1 HR on 42 pitches. Never would’ve expected that. Treinen allowed more earned runs Wednesday night (three) than he allowed in the entire second half (two in 32.1 innings). He had not allowed more than one earned run in any game this season. Not once. You have to go back to September 4th of last season for the last time he allowed multiple earned runs. June 29th of last season was the last time he allowed as many as three earned runs in a game. The Yankees can’t hit good pitching tho. The four-run sixth inning to break the game open make life easy on Boone. David Robertson threw the seventh, Zach Britton threw the eighth, and Aroldis Chapman threw the ninth. Britton allowed a short porch two-run home run to Davis to give the A’s some life — Boone did use him against the middle of the lineup — but Stanton answered right back with the homer. Robertson got some help from Adeiny Hechavarria, who replaced Andujar for defense in the sixth (!) inning.
? Judge reached base three times (homer, double, walk) and Stanton reached base twice (homer, walk). That pleases me. Andujar had an infield single and a walk. McCutchen drew a walk, Hicks had a double, and Gregorius had an infield single. Five the team’s seven hits went for extra bases (two doubles, one triple, two homers). The A’s went 0-for-6 with runners in scoring position. And finally, since I’m pretty sure this will be ignored everywhere, allow me to point out Gary Sanchez blocked the crap out of the ball behind the plate Wednesday. “I just thought his focus and just seeing him today when he came in, just love the look in his eye and his intent and his purpose … He was a big factor for us to be able to hold down a really good offense,” said Boone after the game. The American League Division Series. Yankees vs. Red Sox. I will love it and hate it at the same time. The series opens Friday night at Fenway Park. Chris Sale will start for the BoSox. The Yankees haven’t announced their starter yet — that should happen at Thursday’s workout — but I have to think it’ll be J.A. Happ in Game One and Masahiro Tanaka in Game Two. We’ll see.